Title/Author: Posess by Gretchen McNeil. Publisher: Balzer and Bray (Harper Collins). Source: Borrowed from The Serpentine Library. All in all: A few small issues, but great plot. Please note: May contain a few spoilers. My Thoughts: When I read Maria's review of Possess I was totally excited to read this book. (You can read her post HERE.) I don't think I loved it as much as she did but I still think this is a unique story. Although I didn't absolutely connect with Bridget, I do like her. I think she is funny and feisty. I love how she always wears boots (I think combat boots), is not into being girly nor is she boy crazy. When she shows glimpses of her vulnerability regarding the loss of her father, it is very touching and drew me in a bit more. I also did like Matt, her love interest and I liked how their relationship came about. It might seem a bit too quick for some readers but the fact that they knew each other as children made it a little bit more believable to me. My favorite character however, is definitely Father Santos. He is interesting and mysterious and there is more there than meets the eye. There are a few things in the book that I didn't understand, more specifically how events went from one point to another, but maybe I just needed more explanation in certain cases. On the other hand, I also feel other events are a tad predictable and obvious. Most of all I love the overall plot. It has to do with angels, demons and the mythology that follows them, which I find fascinating. I thought the author did an excellent job creating a backstory and it is very strong. I wish I could think of plots that well developed. The other parts that I feel are well written are the scenes with demons in them. They are creepy and frightening and the mood of some of the supernatural occurences had me turning pages to find out what was going to happen. I don't want to give away too much more, but special kudos goes to the scene in the store and when you get there you will know what I'm talking about. 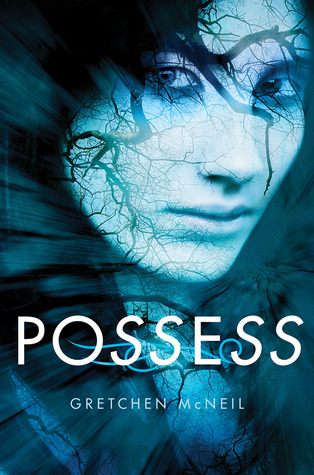 Although I have a few issues with Possess they are minor and perhaps they will be revised when it goes to publication (since I did read an ARC). I think this is a fun story with interesting characters and the creepy factor gets two thumbs up. p.s. I also love the cover! I'm drawn to the cover of POSSESS too, but I didn't know much about the story. It sounds like an interesting concept, and I'm more intrigued after reading your review. It sounds worthwhile to read for the mythology and creep factor. Awesome review. I love the cover too, and it's good to know that even if the main character is hard to connect to, the plot is well developed. I didn't realize this was about angels and demons. It makes me more interested but I'm always disappointed in the angel stories I've read. Still looking for that perfect one. I like that she's not boy crazy. Big plus!! I have yet to write my review but I like it! I though it was a good story with lots of actions! Nice review! I'm sure this one is going to freak me out, but I still really want to read it:) I like books that push me out of my comfort zone, and one as creepy as this one sounds will definitely do that. Thanks for the review! Great review! This is the 1st Possess review I've read. Don't know what it is about demon books, but I'm really into them lately. I'll have to keep an eye out for this one. I've been waiting to get my hands on this book for a long time. Now since it's out, I'll borrow it from the library. This review put things a little more into perspective for me. Thank you. Like your other followers, I also didnt't know it was about angels and demons. I'm glad you liked it, even thought you had your issues. Can't wait to read it. @readingdate-I think the mythology and the creep factor were the strongest parts of the book. @Missie-I'd love to hear your thoughts on this book. @Karen-I'm not sure if you'd love this, but the angel/demon mythology was interesting. Actually, it's more about demons. @Savvy-Looking forward to reading your review. @Jenny-It didn't freak me out, but it had some nice creepy moments. @Andrea-I like demon books too! @Wanda-I hope you get to read it soon. @Casey-I'm glad I'm not the only one with a few issues. I feel like I'm not being too picky.